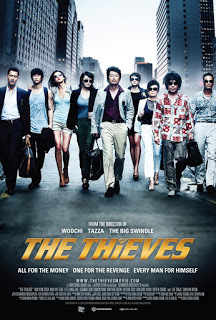 Cast: Kim Yoon Seok, Lee Jung Jae, Kim Hye Soo, Jeon Ji Hyun, Kim Hae Sook, Oh Dal Soo, Kim Soo Hyun, Simon Yam, Angelica Lee, Derek Tsang, Ju Jin Mo, Ki Gook Seo, Choi Deok Mun, Yeh Soo Jung, Chae Gook Hee, Shin Ha Kyun . . .
Popeye (Lee Jung Jae) is the leader of a small professional group of thieves consisting of Chewing Gum (Kim Hae Sook) a middleaged woman, Anycall/Yanicall (Jeon Ji Hyun) a young mischievious burglar and Zampano (Kim Soo Hyun) the youngest of them and Popeye's associate. The four of them fraud people with acting, getting close to them with the purpose of stealing from them where after they sell on the black market, earning their living. They are later joined by Pepsi (Kim Hye Soo), Popeye's old partner and the woman he likes. The team is offered a new deal. To help Macau Park, an thief who in the past had ran away from Popeye and Pepsi with gold bars they stole. Now Popeye and Pepsi see this opportunity to get their revenge on Macau Park and so the team is headed to Hong Kong where they meet another team they will work with, to steal the Tear of the Sun, the diamond worth 30 million US dollars. I definitely understand the popularity of this movie, it has pulled up the standards of Korean action movies and is really a class higher. It was very professional and that is why I enjoyed it. I am pretty good at spotting stupid NGs and that often ruins movies/dramas for me. But this was decent, I only noticed one thing but it didn’t ruin anything. So it was very clean and pro. It had a long story, it doesn’t just end with them stealing the diamond but continues. Though I wished for a liiiiiittle bit different ending this was alright. And what I really liked was that even though they speak in Korean, Chinese and English, we didn’t have those awkward accents and weird talking, the actors had definitely practiced very hard and did a great job. I think its hilarious with the names actually, I can just imagine the writer sitting at his desk and wondering what to name them and he sees some Pepsi, some chewing gum and maybe just ate spinach so he thought of Popeye and then he received a call from a hot lady and named one of the characters Anycall. There was one scene I thought was way too long and that is the one where I spotted a stupid ng, but overall it was good, especially for a long movie like this one. I don’t get this movie. Like yeah I get it, but what… Like yeah, good idea whatever, and interesting storyline. But I seriously wonder how many people wrote this movie together - like nothing was cohesive, except the plot. Like none of the actors acted together, and when they did the script was stupid. I just felt like it was a imitation of a Bollywood movie I once watched, except - besides that the story is different - the writer (most defiantly more writer that didn’t talk with one another) didn’t really bother to make sure that the characters gave a damn about what they were doing. It felt like a group of random thieves that have connections with one another, but barely. And it all makes me go like: how on earth do you trust each other. Which I later on realized they should have thought of. Okay I bet you don’t get anything of this, but to sum up: I wasn’t fond of it, bad wanna-be American action movie, but made decently with the exception of constant revenge/betrayal. But some people (most people honestly) might like it, I just didn’t.